July 18, 2018 By This post may contain affiliate links. Don’t let the traditional round shape of these Chocolate Peanut Butter Cookies fool you into thinking they are ordinary treats. 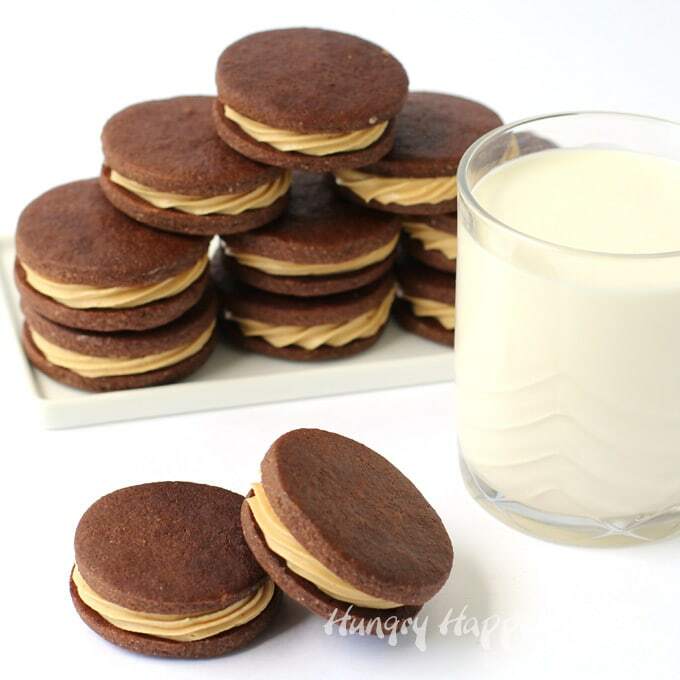 With each bite you’ll realize that these creamy peanut butter fudge-filled chocolate cookies are really decadent desserts. Chocolate and peanut butter are one of the most popular flavor combinations of all time and I am a huge fan. I could eat just about any dessert made with the two including these Chocolate Peanut Butter Cookies. They are definitely a plain looking dessert, but they have serious flavor and texture. 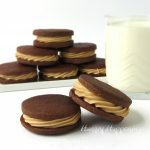 Take a bite into the crispy chocolate cookie and you’ll find the smoothest, most amazing, peanut butter fudge filling inside. The filling is made using white and peanut butter chips along with creamy peanut butter. It melts in your mouth but the filling is firm enough that when you bite into the cookie it won’t ooze out. 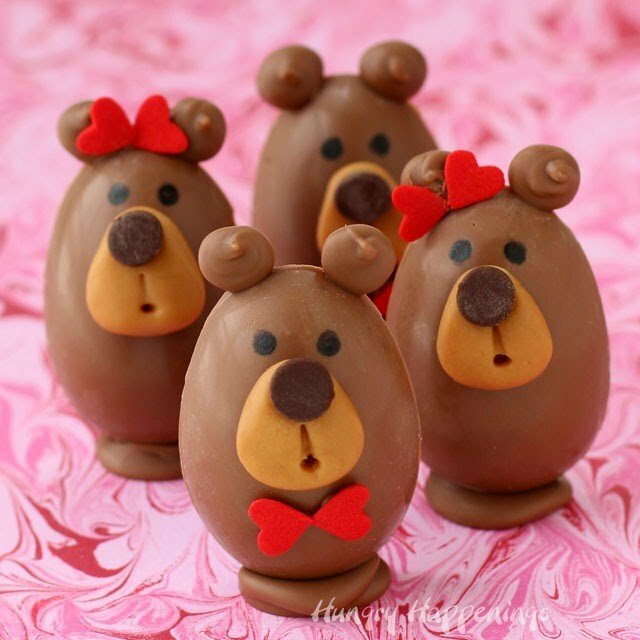 I love chocolate in just about any form and enjoy it almost every day. The only downside is that chocolate can cause heartburn. Do you have that problem, too? I have been suffering from heartburn since I was a young child. I remember going to swim practice and doing backstroke and feeling that burning sensation in my chest. It was so uncomfortable that I just wanted to roll over, but backstroke was my best event, so I just learned to put up with the pain. As an adult, and the owner of a candy store who made and tasted chocolate every day, my heartburn became a chronic problem. I couldn’t imagine my life without chocolate. It was bad enough that I gave up pizza, another major cause of my heartburn, for a few years while I was in college. Can you believe that? But chocolate, never! I love it too much. After many years of suffering, I was finally prescribed an acid reducer when I was in my early 30s. I can’t tell you how amazing it was to get through a day without that awful burning feeling. My only complaint was that I had to swallow a pill every morning. To many people, swallowing pills is not a big deal, but for me, even after having my esophagus stretched – twice – I still have trouble swallowing pills. 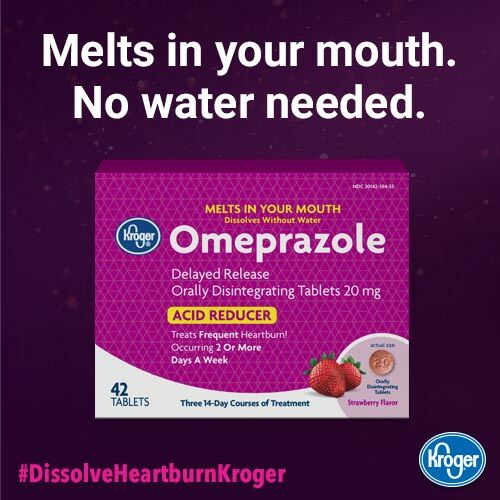 So, when I discovered new Kroger Omeprazole Orally Disintegrating Tablets (also referred to as ODT) strawberry-flavored tablets made with MELTech™, that I can simply allow to melt on my tongue, I was thrilled. I talked to my doctor before making the switch and have been taking them for a few weeks now. The Kroger Omeprazole ODT works as well as the national brands, and as an added bonus, costs less. Each tablet gives me relief from my chronic heartburn for 24 hours so I’m sure to take one of the tablets every morning before I eat breakfast. That way I can enjoy things like these Chocolate Peanut Butter Cookies and pizza without any issues. 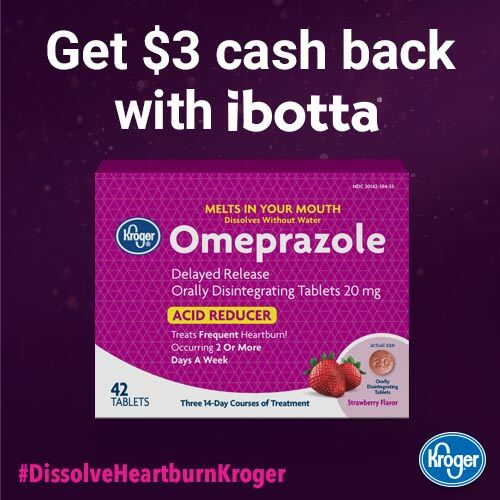 If you give the Kroger Omeprazole ODT a try, be sure to use as directed for 14 days to treat frequent heartburn (occurring 2 or more days a week). It is not intended for immediate relief. It may take 1-4 days for full effect. For a limited time you can get $3 cash back with ibotta. You can shop for all of these ingredients and pick up your heartburn medication all on the same trip! I love being free of heartburn and being able to eat what I like. How about you? Start by making a chocolate cut-out cookie dough, roll it out, and cut it into circles then bake. Dust a silicone mat and your rolling pin lightly with cocoa powder before rolling out the dough so that the dough won’t stick. Use a 2-inch round cookie cutter to cut out your chocolate cookies. It’s the perfect size for a sandwich cookie. As you make your cuts, place the cutter as close to the previous cut, thereby getting as many circles cut out of one sheet of dough. Then re-roll the dough and cut more circles. The more times you re-roll the dough, the more gluten will form in your cookies. If you re-roll too many times, your cookies can become a bit tough. If you want your cut-out dough to hold its shape perfectly, remove the excess dough from around the cut-outs, then pop your silicone mat (set on a stiff surface like a baking sheet or cutting board) into the freezer for 5-10 minutes. When you pull the silicone mat out of the freezer, you can simply peel the perfectly round cookies off and place them on a silicone mat or parchment paper lined baking sheet in order to bake them. NOTE: You might have noticed that the cookies in the pictures above have two different shades of brown. When developing the recipe for these chocolate peanut butter cookies I tried out two different cocoa powders. Some of the chocolate cookies are distinctively darker in color and happened to taste a bit better too. Those cookies were made with special dark cocoa that contains a blend of naturally and Dutch Processed cocoa. I really liked the pictures of the lighter cookies though so I wanted to share them too. Melt white and peanut butter chips together then stir in salt and creamy peanut butter. This will make the most amazing peanut butter fudge but will be very liquid at first. Allow it to cool at room temperature, stirring it often, until it thickens to the consistency of frosting. 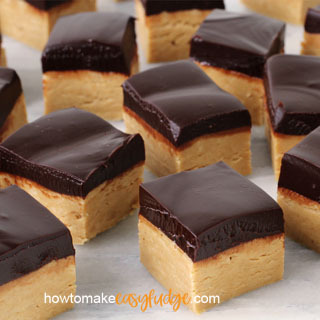 This process is a little bit finicky because you want the fudge filling at the perfect spreadable consistency. The longer this fudge sits, the firmer it will become. If it gets too firm, you can warm it in the microwave on the low setting for 10 second bursts of power, stirring after each. If you melt it too much, just allow it to cool again. Do not refrigerate as the fudge will cool too quickly around the outer edge of the bowl and that will be difficult to stir into the more liquid center. I made my fudge filling first then made my cookies. By the time the cookies were baked and cooled my peanut butter fudge filling was ready to pipe onto the cookies. Pipe or spread the fudge filling over one chocolate cookie and top with another cookie. 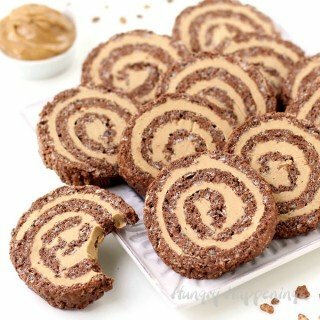 I personally love how these cookies look with a swirl of peanut butter filling piped onto them and found it easier to fill the sandwich cookies using this method, but you can spread it on if you prefer. 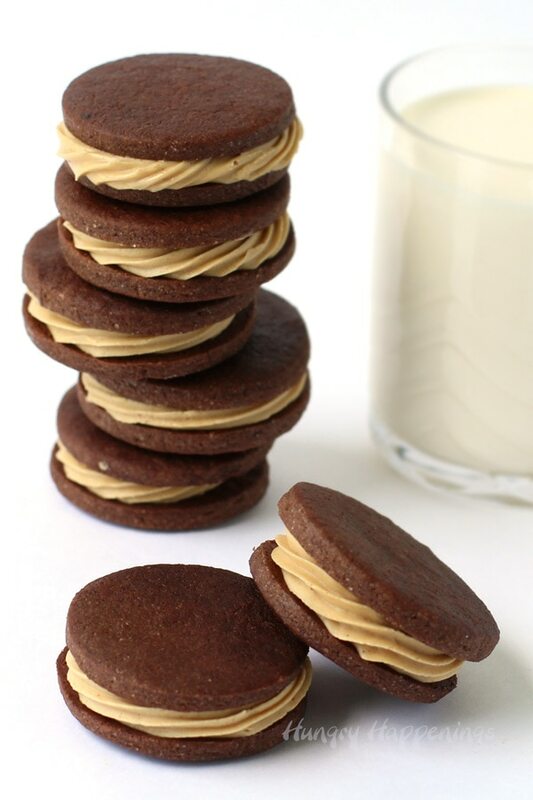 Chocolate sandwich cookies filled with creamy peanut butter fudge. Combine the white and peanut butter chips in a microwave safe mixing bowl. Heat on high power, for 30 second increments, stirring after each until melted. 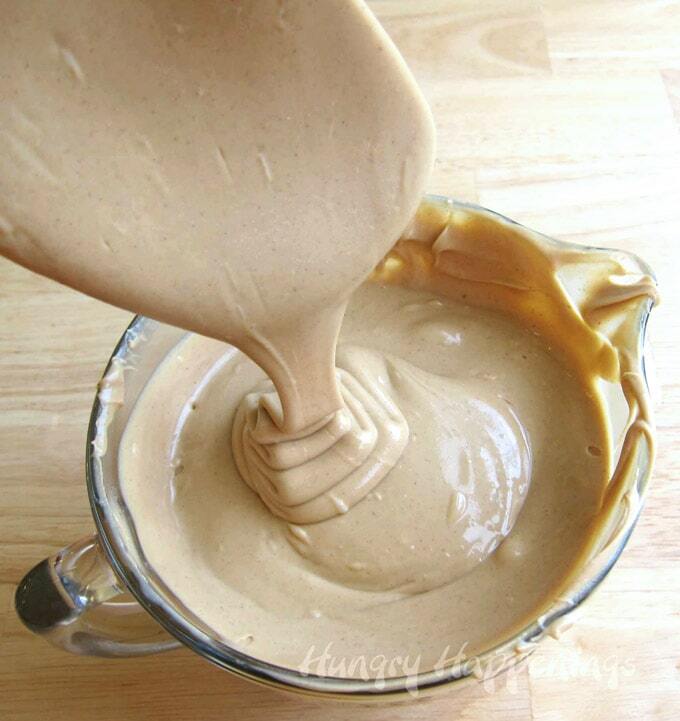 Stir in the peanut butter and salt until well blended. Let cool at room temperature, stirring often, until the consistency of frosting. Whisk together the flour, cocoa powder, baking powder, and salt then stir it into the wet ingredients just until combined. Dust a silicone mat or cutting board with cocoa powder. Roll dough out to 1/8th of an inch thickness. Cut 2 inch circles using a round cookie cutter. You should get about 60 circles out of one batch of dough. Set dough circles on a silicone mat or parchment paper lined baking sheet. Refrigerate for 5 minutes then bake for 10-12 minutes until the edges look set and the top no longer looks wet. Once the fudge filling is frosting consistency, you can pipe it or spread it on half of the cookies then top those with another cookie. I was compensated by Mirum to share this information regarding Kroger Omeprazole ODT, but the story is my own. If you feel like sharing your experience with this product leave a comment below. If you love peanut butter and chocolate together, you might also like these other yummy recipes. I’ve never been a big fan of sandwich cookies, but I could eat a few hundred of these. Yum! They are definitely better than your average store bought sandwich cookies! I’m drooling! Can’t wait to try this! ahhh these look sooo yummy!!! Glad you found something to help with the heartburn as well. Will have to keep that in mind for myself!! We have really been enjoying these cookies. 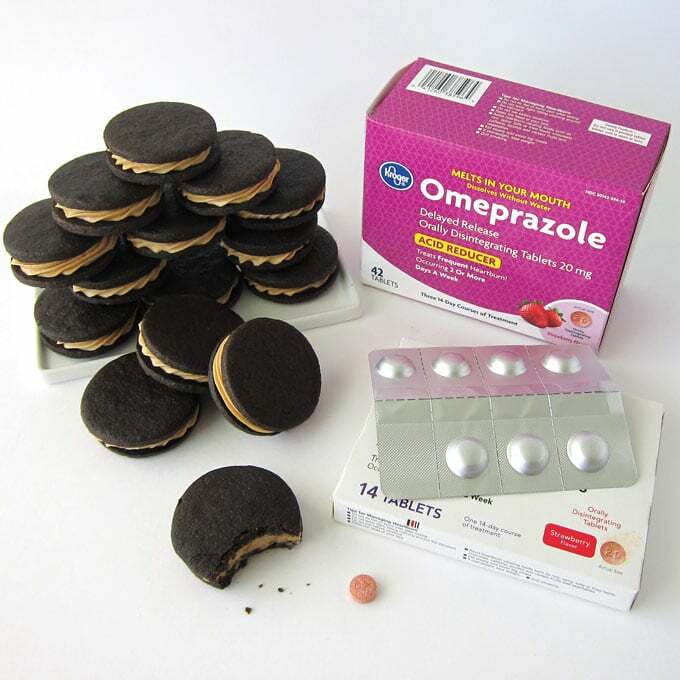 I hope you give the cookies and the Kroger Omeprazole ODT a try! That peanut butter filling is fantastic!! We use Omeprazole ODT too! These look like Oreos, but way way better! Oh my, I want to try them now. I love Oreo Cookies but would totally grab one of these first! I love the peanut butter fudge filling. Those peanut butter cookies look so divine I would want to eat the entire batch! Believe me it was hard not to eat the whole batch! Oh my!! I am a DESSERT person for sure, and these are getting added to my list of things to make before the summer is over. Thanks for sharing! Chocolate and Peanut Butter combo are my favorite! I tried the OCD tablets last month! These look amazingly dangerous!! I can see them disappearing quickly! These look great. I love a new recipe! Mmmm mmmm mmmmm! 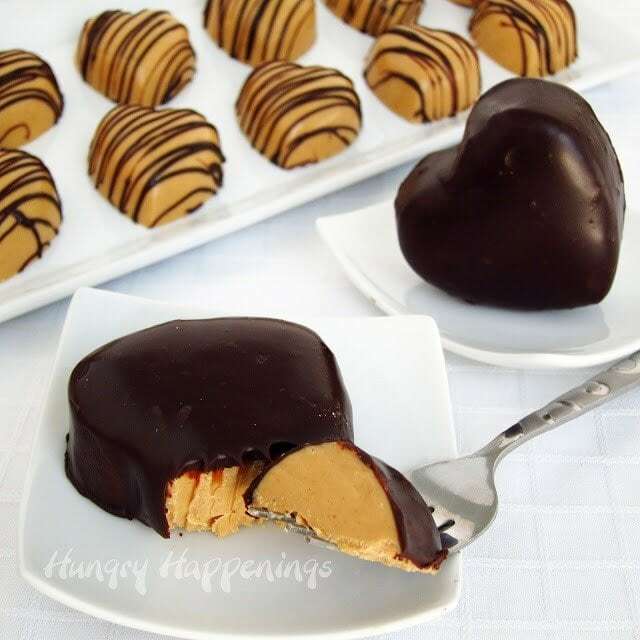 I feel like chocolate and peanut butter just go together, and this recipe is to die for. I make things like this for church once a month, and I’ll be making about 8 dozen of these for the next time! Thank you! I hope everyone at your church enjoys the cookies! I have never even heard of having an esophagus stretched, but that sounds beyond horrible. This definitely looks like a recipe I will try! I love your blog so much! I’m happy to see that you are getting sponsors and such. You deserve to be compensated for all that you create for us strangers! Thank you!!!! Yeah, for people who have acid reflux, swallowing becomes a problem so when we have an endoscopy the doctor usually stretches the esophagus so that we can more easily swallow food. I just had it done again last week. I was under sedation, so I didn’t feel a thing. Afterwards I was a bit sore for about a day. It’s actually quite helpful.